Veneers are part of the world of cosmetic dentistry. Cosmetic dentistry consists of dental procedures done to enhance the visual of your teeth and smile as opposed to doing it for the purpose of enhancing your dental health. A veneer is an artificial covering over the front of a tooth and saves a good amount of the natural tooth structure. There are many reasons why someone may want to check into cosmetic dentistry. Veneers are one of the options you can use to resolve a variety of concerns and/or issues. Veneers can change the color, size and/or the shape of your tooth. You can get veneers on one tooth or multiple teeth. When you are not happy with the way your teeth and smile looks, it is natural to want to fix whatever it is that may be bothering you. Luckily there are a few different options to choose from to make your teeth look and feel better. The reason you are checking into veneers and alternatives is important in determining which option is best for you. Here are some alternatives to veneers and reasons to utilize them. If you are seeking to have whiter teeth, you may benefit from just simply having your teeth whitened. You can also check into microabrasion, which is a procedure that removes stains or spots that may appear yellow, white or brown in nature. This process is quick and painless, removing a thin layer of your tooth enamel to eliminate stains and discoloration. Crowns are another alternative to getting veneers. The main difference between getting a crown over a veneer is that you can save more tooth structure with one over the other. Veneers leave the majority of the back structure of your tooth, while crowns cover the whole surface of the tooth down to the gum tissue. It will be necessary to remove more of the tooth’s natural structure when getting a crown as opposed to veneers. Depending on the reason you are seeking veneers and/or alternatives, you may want to consider getting an implant. There are cases when a tooth is not able to be saved therefore eliminating the possibility of using veneers or even dental crowns. Implants allow for a tooth to be extracted and then replaced with an artificial tooth. Dentures are another option for artificial teeth. Dentures consist of artificial teeth and gums that professionals mold and form to your mouth for a missing tooth or multiple teeth. They act similarly to implants but are not permanently in that one place. 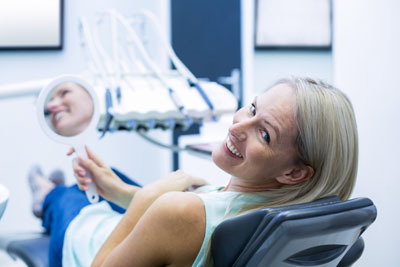 You may be seeking cosmetic dentistry because of the alignment of your teeth. Maybe they are crooked or contain large and/or uneven gaps between them. It is best to converse with your dentist regarding why you are seeking cosmetic dentistry, as you may get your desired results from orthodontics by getting braces as opposed to getting veneers or any other work done. Veneers are definitely an option worth checking into if you seek cosmetic improvements, but they are not for everyone and may not even be necessary to get the result you are seeking. A consultation with a cosmetic dentist can assist you in the process of making the right decision for you. Your perfect smile is only one step away. Request an appointment in our Houston dental office here: https://www.pearlshinedentalclinic.com. Call us at (281) 477-7200 for more information from Pearl Shine Dental.